This is the view out my sunroom window. 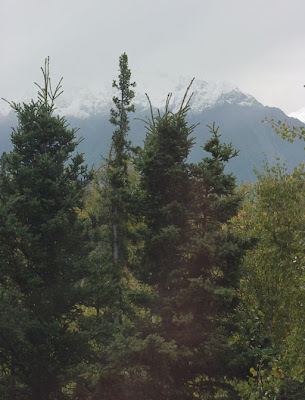 That's Pioneer Peak, about 3000ft of elevation, of which the top 500ft or so is covered in snow this morning. Yesterday it was bare. The Chugach range behind Pioneer Peak is solid white. Winter is coming early this year. Maybe the Republicans are right, global warming is a myth! Well, yeah, I wasn't bitching. Did it sound like bitching? 'Cause I meant it to be more like bragging. Bawahahahahaha! Yep, heard that wonderful word on the Weather Channel the other night, snow. It's not here yet, but yesterday as I was working in the yard with my wife I asked her if she thought we'd get an early winter (last year didn't happen until January, but that was mostly me praying because our plow trucks weren't working right and we didn't have replacements yet, got them right before Xmas, that's when I stopped praying). MWT, I always loved Savannah in the fall. Beautiful city. But, my God, Man, how you find your way through those traffic circles is beyond me. Ahh... Savannah pathing. :) Gotta love those salt marshes. Back when I first moved here, my morning commute was to go north, then east, then south, then east, then north. This took 40 minutes, and 20 of it was in the first north-then-east, which was through highly congested main roads (there aren't any other possible routes). After a year of that I moved somewhere that was past the north-then-east part. So now it's a giant U instead of a giant Z.
MWT, my wife and I used to visit a friend of ours who lived in Savannah. No matter how many times we stayed at his house, I would have to stop at the visitor center at the edge of town and call him to come guide us in. I think Savannah is laid out with malice aforethought, just to confound us dammed Yankees. May I please draw or paint from your incredible landscape photo? I loved it at first sight and it's giving me ideas for pastel paintings or something like that. I'd credit you and link back to your blog of course. Robert, sure have at it. Just do like you said, link back to the original on my site. Thanks.